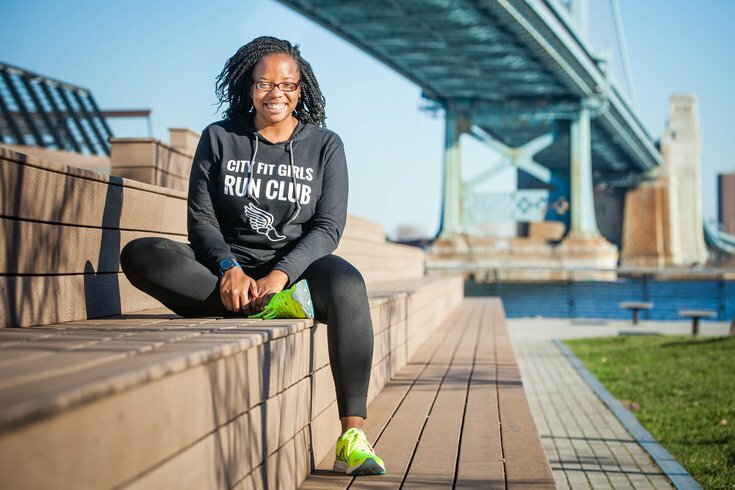 Kiera Smalls, co-founder of City Fit Girls, at Race Street Pier. If you're one of those people who despises even the thought of going for a run, imagine not only loving it, but having the spirit and courage and motivation to get others to do it with you. Then, imagine your group of healthy-living, fitness-loving women takes on the world, expanding from one neighborhood to the next and the next. That's the life of Kiera Smalls, the co-founder of City Fit Girls, a fitness community, running club, blog and more. Smalls began CFG in 2012 with friend Takia McClendon, and it's been growing ever since. But when she's not working up a sweat with her girls, she's encouraging the entire city to get moving as the community manager for Philly bike share Indego. As someone guiding her peers to get healthy and doing it all with a smile, Smalls is definitely a Fearless Leader. Below, she chats about what's next for CFG and what her biggest wishes are for 2016. I hear you’re currently training for your first marathon! What’s the best part of the training process? The best part is watching how much progress I’ve made over the past few weeks. I’ve been running nonstop since the Rock 'n' Roll Half Marathon, and the quality of my runs has improved tremendously. What’s the first thing you’re going to do when you finish that marathon? Great question! I planned this before I paid for the registration. I am going to spend a few days on a beach. I registered for the New Jersey Marathon scheduled for May 1. It’s the day before my 27th birthday. I plan to enjoy the beach longer than just on marathon day. What’s the strangest thing you’ve seen while running in Philadelphia? I haven’t seen any strange things while running, but I have seen tons of cool murals, interesting architecture and tons of awesome statues that I wouldn’t have seen any other way besides running. City Fit Girls has grown so much in just a few years – what’s next on the horizon for CFG? We are launching run clubs in a few more cities and creating more opportunities for brands to connect with the women in our network. We’re also prepping for our spring and summer bootcamp series! I know the girls are wondering when they’ll be back. At CFG you help other women meet their health and fitness goals. What’s your secret to keeping others motivated? Building a welcoming and positive atmosphere for women of all fitness levels to feel empowered and able to reach their goals. Someone can post on our Facebook group that they’re nervous about completing their first half marathon, and within an hour, you’ll see 20 comments from newbies to experienced runners encouraging and motivating them to go after it (even offering to run the race with them). What’s your favorite part about working with Indego? Managing social media to engage with our riders. It’s so much fun to hear about riders' experiences and to see the cool pictures they capture from their trips. I also enjoy working to get more low-income and people of color on bikes. Bike share is really for any and every one, and I love encouraging more people to give it a try. What is your biggest wish for the bike share in 2016? That more residents see Indego as a means for transportation. Whether Indego gets you to and from your destination or connects you to SEPTA or the parking garage, it’s at the top of their mind when deciding how to get around in the city. What do you think the city and its citizens can do to make Philly healthier in 2016? For companies and businesses to continue the trend of offering wellness programs to their employees. Not just giving them a list of resources but actually finding fun ways to hold them accountable. Some examples: Buy standing desks for the whole team, host biweekly or monthly physical activities, offer incentives, etc. Work is where we spend most of our time, and companies and businesses have a huge opportunity to get more people moving and leading healthier lifestyles. What does being a Fearless Leader mean to you? It means staying true to your values. There have been times where City Fit Girls had to say no to opportunities because a brand's product/mission did not align with what we were trying to create. It feels good to stick to our mission since the beginning despite the growth and interest from others.